Discussion in 'Music, TV, Movies & other Media' started by chris155au, Dec 1, 2018. 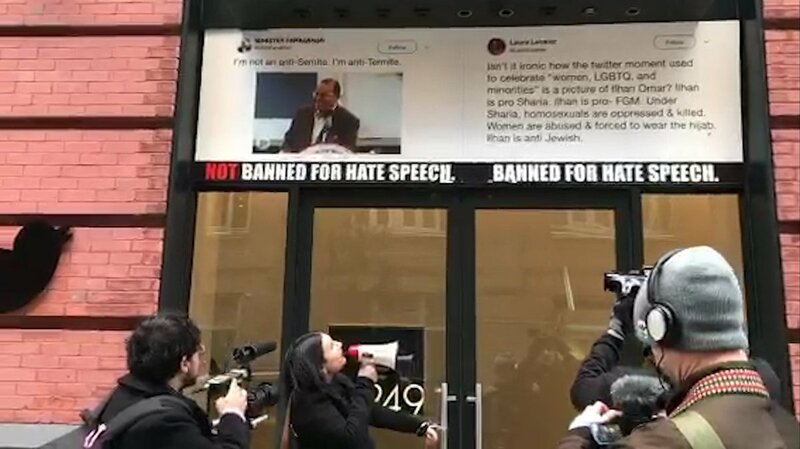 Laura Loomer has been banned from twitter for saying literally NOTHING which violates twitter's rules, while Louis Farrakhan remains, after callling Jews "termites." This is one HELL of a double standard! Anyone who cannot see the double standard after this, NEVER WILL see it! If someone can identify the rule that was broken, then you have done better than me! The media aren't reporting a specific rule but I guess that is down to Twitter not saying much. straight ahead, modernpaladin, Chester_Murphy and 1 other person like this. In general yes; Social media companies have always been generally poor at managing bad behaviour on their platforms and different groups of users tend to engage in different forms of bad behaviour that aren’t easily measurable or comparable. I’ve not seen anything proving any political bias in that inconsistency. This is one HELL of a double standard! Anyone who cannot see the double standard after this, NEVER WILL see it! You see this keyboard in front of you? You should be able to post any permutation of those keys up to 280 characters, without fear of getting banned. Legitimately any combination. So what are you saying? This isn't possible on Twitter? Yes. They have a policy which let's people be banned for saying things. Well speaking of the policy, do you know what part of it was broken? The media aren't reporting a specific rule but I guess that is down to Twitter not saying much. I deleted.my Twitter account when they deleted Alex Jones'. Should not have been banned. Wasn't using it anymore anyway. Loomer's a lunatic - a Jewish anti-Semite and serious attention whore. But she should not have been banned. The NPS must honor free speech. Sorry, she is a Jew who is an anti-Semite? No need to apologize - she's not unique. This is how 'they' beat you; beat you down with minor details and sap your energy for the bigger issues. There is no need to fear Farrakhan. His perpetual absurd spoutings only testify to his detestability. He so undermines his own position that reasonable people should be glad for his presence. He's odious in various ways, but also quite brilliant. Good/bad like many of us. Twitter is a private company and users of the service must abide by the term of service. Don't like it, don't go there. The 1st ammendment covers free speech in regard to an individual vs the government. It doesn't give any protection against a private entity. You can't force a newspaper to publish your speech or a tv station to put it on the air either. Same goes with twitter and facebook. BillRM, DarkSkies, AZ. and 1 other person like this. It should just be assigned a number. Free speech in the NPS must be protected. crank, LogNDog, Blaster3 and 1 other person like this. Still not proof of active political bias. Arguably proof of inconsistent outcomes, though I think there is a relevant distinction between a personal attack on a named individual compared to generic discriminatory speech. Also, the other Tweet is somewhat open to interpretation out of context; I don't know if it's the opinion of the poster or a quote from the pictured man and it could be taken as a (poorly worded) claim not to hate all Jews, only "bad" actors. Regardless of the rights and wrongs of each tweet and regardless of the perceived politics involved, they're not really comparing like-with-like. As I said, social media companies (all companies and all individuals really) are bad a dealing with this kind of thing but frankly whatever they did and why ever they did it, someone would complain and call them biased. I'm sure there are examples of companies condemned as being controlled by Jews when they (legitimately) act against Antisemitism. Actual evidence of active political bias would need to be based on proven motives, not just a handful of extreme outcomes. You got a source to back that up? Twitter is a private company and users of the service must abide by the term of service. Don't like it, don't go there. And what part of the terms of service did she violate exactly? Still not proof of active political bias. Arguably proof of inconsistent outcomes, though I think there is a relevant distinction between a personal attack on a named individual compared to generic discriminatory speech. A distinction, yes, but both should be bannable offences. Also, the other Tweet is somewhat open to interpretation out of context; I don't know if it's the opinion of the poster or a quote from the pictured man and it could be taken as a (poorly worded) claim not to hate all Jews, only "bad" actors. "Bad actors?" What are you talking about? Including every right wing commentator and journalist?